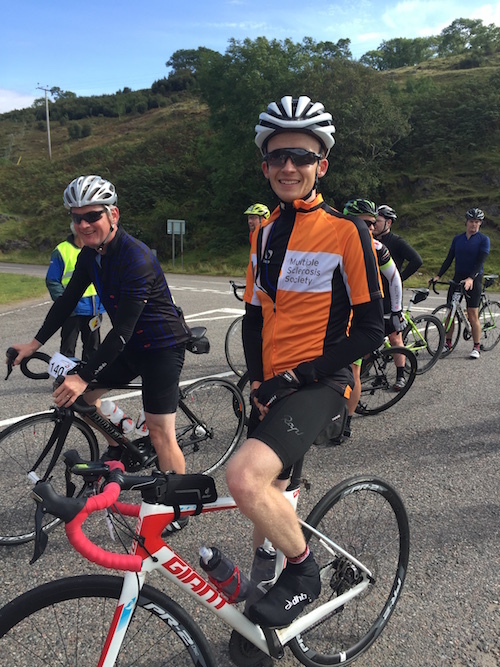 Finally after the false start of Tour of the Highlands (I broke my collar bone three weeks before) it was time to tackle my ride for MS, the big one, Bealach Mor sportive with the Bealach na Bà climb. Full details on the build up to this is in my earlier blog post. We drove up to Archintraid after work on Friday night, arriving at the cottage we’d booked, in the darkness. Single track lanes, deer, moonlight shimmering on some open water by the road - while we couldn’t see anything we just knew it was going to beautiful in the daylight the next morning. I got settled down at around midnight, and the brain started ticking over the day that lay ahead. Daylight came, and the scenery didn’t disappoint. 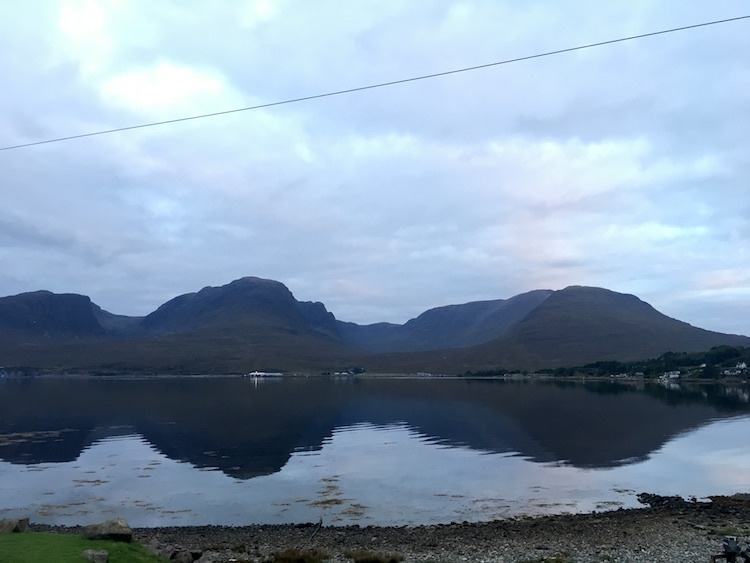 My alarm went off at 6, I opened the blind, and the Bealach was bang straight in front of me. Oof, I’ll be seeing you later I thought! Breafast consumed, I drove round to Kinlochewe - the start-finish, and we got to see this part of the world a little better (wow). But I was also taking note of the road surface and elevation changes for later on. We arrived with tonnes of time, I grabbed my number, timing chip, and went back to the car to get ready. I ended up sitting in the car for quite a while, as there were clouds of midges everywhere! Ready to go, I got round to the start area, the midges were attacking everyone. I wasn’t going to head out early (starts were 9:00 - 9:30 with the instruction not to get to the Bealach road until 11, which is when it would be closed to other traffic), but I wasn’t going to hang around with all these little blighters. Luckily once moving they weren’t a problem. Dibbed the timing chip and got on the road. Made my way past a few groups, we were all finding our pace. Quickly there was a decent climb on, I saw my heart rate reading rise, but felt good, and kept the legs ticking over. There was one guy ahead of me, I was just getting to him when three other riders arrived alongside and I grabbed a wheel. So from there it turned into the five of us working together. We made a good pace, maybe too good, as when we got to the first feed stop in Lochcarron, I thought we were too early for the 11am road closure, so I and one other, Kevin (I think), pulled in. I figured it better to grab a flapjack and have a natter than do the same wait without flapjack at the road end! We had a few minutes, then moved on and actually kept nattering all the way to the Bealach turn. At the turn, the road wasn’t yet quite closed, there was a HGV on it’s way down, so I decided to wait before hitting the slopes. Kevin continued on, and while I was waiting a few dozen other cyclists rolled in. Finally, lets get this hill started already, I dibbed (for a climb time) and hit it. The wind had been light to fresh and I could feel it on my face for the southwest run on the lower slopes. But I pushed on - no good leaving time on the hill when I’d been eyeing this up for so long. My heart rate was soon in the lower 170s which is about as far as I push it for any length of time and this was due to be another 30-odd minutes. I followed the road round and the wind became more favourable, not strong, it was surprisingly calm for such an exposed spot, but there was some help there. The gradient was good and I was churning the pedals in whatever gear kept me around that target heart rate. And on it went. I looked round once or thrice, beautiful, but mostly I wanted to keep focus on this climb. Time and miles clocked by, and it started to ramp up to the steepest sections towards the hairpins. I pushed on, needed to stand and push the pedals, the speed suddenly felt slow, 6mph maybe, I pushed more, the heart rate went up another couple of notches and I felt it. I thought I’d overdone it, and tried to pull it back in a bit. It now felt really hard and slow going. Up ahead the guys I’d been riding with earlier had split, and they were coming towards me. This gave a little extra motivation and I passed the first pair while navigating the hairpins, and had another mental boost from the tought "well now you have to stay ahead right" once past. After the hairpins it evens out a bit, I told my legs to shut up and threw what energy I had left at the pedals. 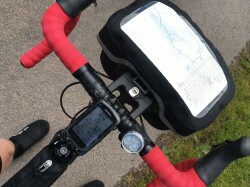 Segment finished flashed up on the Garmin, I hadn’t been watching that screen, but it was good to see it was complete. The time said 32:30 which I knew was decent, I was quite happy with that. But the event chip timing finish was just a bit further on - keep going! I got there, slammed on the anchors, and got my chip dibbed. 33:26 from the event timing. Now where were those other couple of guys? The descent was good. I was taking it quickly, but with enough in hand - as I have ever more since my crash in May. 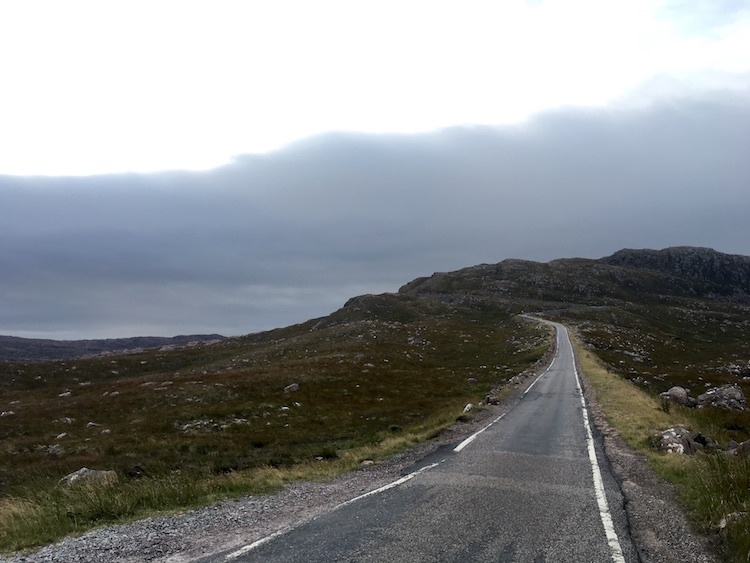 I peered down the road and could see one of the guys in the distance as we zigzagged our way down to Applecross. I didn’t stop at the feed station, neither did he, I had plenty of food and had enough water, I felt good to make the next one. It took a while but I caught up to him - Charlie (again I think - it's hard to get catch a name sometimes with the wind) and we had a quick chat before settling to work together to try and reel in the next guy. After Applecross the road follows the coast, first bearing north, then southeast and round to Shieldaig. I’d been warned by everyone who'd cycled this way that while there’s the big climb, it’s the dozen little buggers after it that do the damage. For the run north I was getting a helpful push from the wind, and the first few climbs felt good, the legs felt strong. There was a car that overtook Charlie and I and we ended up split (so easily done on these single-track roads). All of a sudden as I crested another of the little killers I saw the next guy - Jamie (again I think). Right, target acquired! Again it took some time, but I pulled alongside and we had a chat before starting to working together. The course had turned and we were no longer getting any wind assistance, in fact the wind had become a bit of a pain in taking the momentum from you along with the gradient on yet more little killers. I was feeling it now. The two of us pressed on. I was thinking, surely Shieldaig can’t be far. It felt far. At some point Jamie and I split and I was on my own, but phew finally Shieldaig came - the location of the third and final feed stop - and this time I was stopping. One of the perks of an event for me is a natter with volounteers at the feed stops, and anyway I needed to top up the water bottle - despite the forecast it had turned out warm and I’d sipped my way through far more than usual. I took the opportunity to ring Gemma to update her on my ETA, and grab a flapjack - naturally. While I was stopped two guys raced through, one with a COG Velo top on, and the other I later spoke to was Niall, he bumped the curb, grabbed something and was off again. I was sorting myself out and Jamie rolled through. I hit the road again and headed after him. My legs were definitely feeling it, definitely definitely. It took a while, but I caught up with him, he said he was feeling it too. We worked together again for a while, but then got split, and it was a solo run to the finish from there. The last handful of miles were a delight - the final climbs were but a memory and it was a good fast roll back into Kinlochewe. Slam the anchors and dib the dibby thing. Third home, although I knew the two guys in front must have started later than me, I was very happy with that. In the village hall the spread was good, bean stew, tea, and all the cakes. Riders trickled in. I met and shook hands with most of the guys I’d ridden with. Timed flashed up on the computer screen. Oho, a dozen or so riders were in and my climb time was still good, I was going to need to wait around a bit longer - there was a KOM prize for the fastest time. The atmosphere in the hall was great, good chat, good cake, we stayed quite a while. After an hour or so they called it, we got photos and Gemma and I got on our way. What a great day on the bike. As I already said I ended up third home, fastest on the climb, and the 5th overall time. That’ll do very nicely indeed, very nicely. I captured the ride on the camera attached to my bike (mostly the climb), along with a couple of clips from Gemma's phone. I've embedded it below, or view it here. My plan as we were in the area, was to ride Bealach na Bà both ways, north on Saturday in the event, and south on the Sunday morning. The weather forecast for the Sunday was bad, big winds and rain, but I held out hope. And just like the day before the forecast was wrong. I awoke just before 6 and headed for the window - beautiful purple skies and not a breath of wind. The ride was on! We needed to be out of the cottage by 10, so I decided my north coast loop to Applecross was too ambitious for the time available. 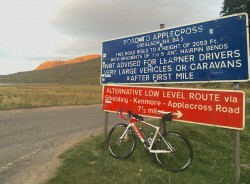 So the only alternative to cut the miles was to do the Bealach both ways this morning, ha! I set out over to the base and I was soon spinning steadily up the hill. I stopped a number of times to take photos and videos. It really was a lovely morning. On the lower slopes I encountered a stag grazing by the roadside, he starleted and ran off a hundred yards or so when he heard me. I was pretty pleased to see him so close, but little did I know it was only the start. Further up, just before it ramps up for the hairpins there was a herd of 16 does and a couple of fawns. They were less bothered by me and the bike, I passed through with them on both sides of the road. Wow. The wind had been almost completely still until up at the hairpins, but suddenly up there it was quite fresh - as you can hear on the video. I continued over the top and started to descending, here too the wind was quite apparent, and I needed to hold on with some concentration as the front wheel took a gust or two. Nearly in Applecross, and I was again joined by deer. Three stags this time, they were on the road with a wall one side, fence the other, I slowed and they stood in the grass at the side while I passed. So close to them! I whipped out the phone and managed to get a video. In Applecross I paused for a few minutes by the Inn, before turning for the return. Any boy this way did I feel the wind - oooch. I was just spinning steadily, but it did take some effort to keep moving forwards. The final section really sticks out in my mind - all of a sudden, when you think you’ve done quite enough, you turn and it rears steeply into a switchback. Crushing. Over the top and I just enjoyed the descent - this way you really can enjoy the view, although plenty of concentration as any lapse and you’d be off the narrow road, in a pothole, or too fast into the next corner. What a weekend. Incredibly lucky with the weather. 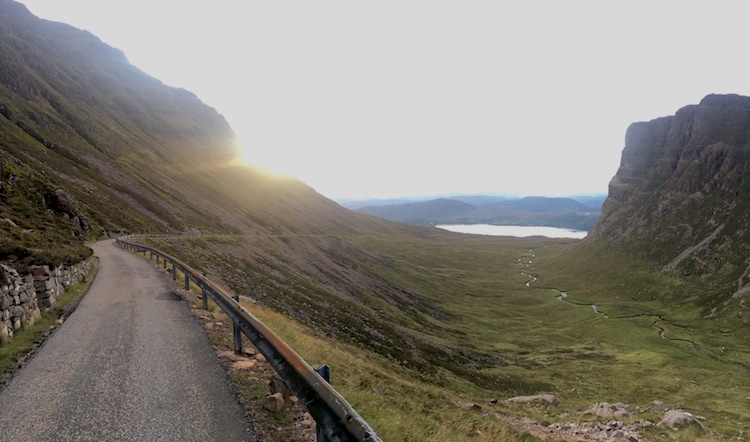 While the Bealach has been crossed off the bucket list, it still very much is on the list - I have to get myself up this way again it is just stunning. This was my raising money for the MS Society ride, so that’s drawing to a close. 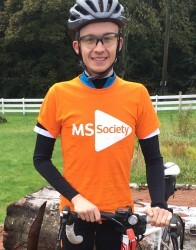 Riding for the MS Society this year has really given me focus and meaning to my riding. 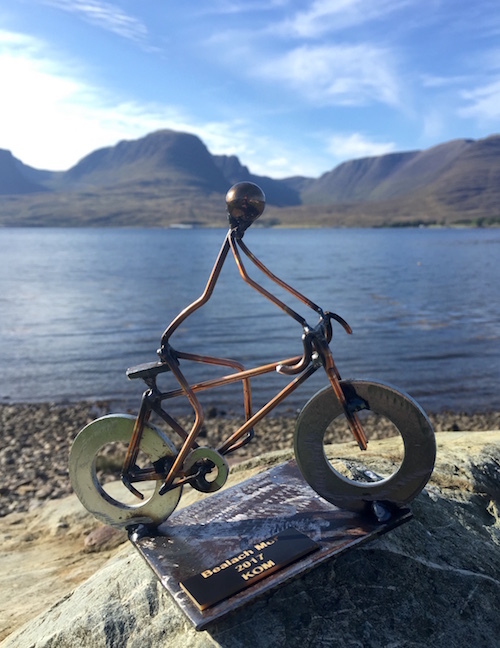 When it was devistating to end up in hospital and miss out on Tour of the Highlands, knowing I was riding with purpose put me back on the bike more quickly, and put my head back together at a hard time. 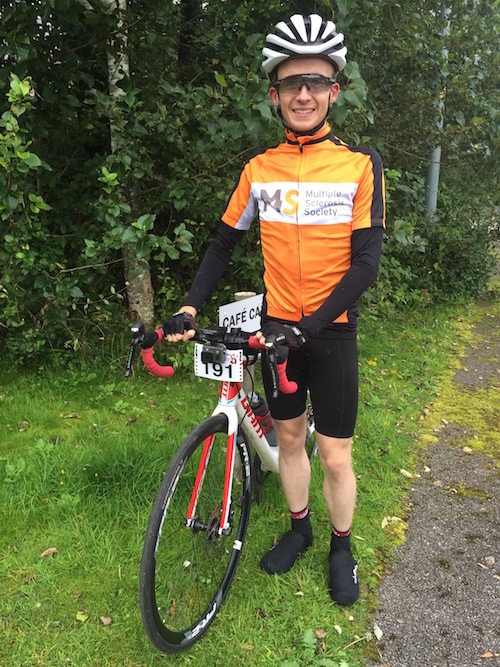 Raising funds to help fight MS is really important to me as I have a close family connection to the disease. A massive thanks to everyone who has donated already, I’ve been overwhelmed by the generocity - but if you haven’t donated already and would like to please visit my JustGiving page.